[ Pierre Alexandre Tardieu, French engraver.. ] Autograph Letter Signed ('Alex're. Tardieu'), in French, to the London printseller W. J. 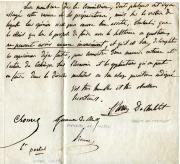 White, responding to an offer for 'les Epreuves avant la lettre du Saint Jérôme'. With autograph note by White. 'Rue Taranne No. 7', Paris. 7 February 1837. 2pp., 4to. Bifolium. Addressed, with seal in red wax and postmark, on reverse of second leaf to 'Monsieur White | Brownlow Street holborn | London'. Thirty-seven lines of text, including a thirteen-line postscript. 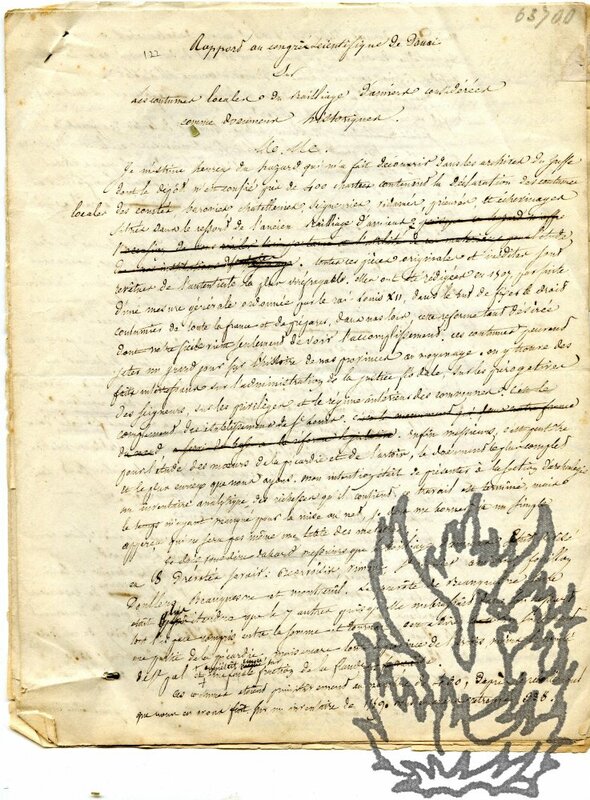 In responding to an offer for 'les Epreuves avant la lettre du Saint Jérôme', made by White in a letter of 29 September 1836, through' Mr. Chocarne', i.e. the painter and engraver Geoffroy Alphonse Chocarne (1797-c.1857), Tardieu writes: 'deux mille francs, c'est mon Dernier prix, tant pour mon honneur que pour les intérêts de ma femme et ma fille qui doivent me survivre'. Autograph Letter Signed ('MacDonald'), in French, to 'Monsieur le Major Walter Scott' (son of the novelist). 1p., 12mo. Bifolium. Addressed on reverse of second leaf, with broken wafer, 'A Monsieur | Monsieur le Major Walter Scott | Hotel Mirabeau rue | de la Paix | A Paris', and franked 'Mal. Duc de Tarento'. On aged and lightly ruckled and damp-stained paper. 11 lines of text. He writes in the hope that Scott and his 'Lady' will be able to come 'pour diner chez moi en famille seulement'. MacDonald was of Jacobite stock, and a near-relative of Flora MacDonald. All but one item printed in Paris, Paris-Auteuil and Tournon, between 1859 and 1888. The fifteenth pamphlet printed in York by Coultas and Volans of King Street, 1879. A total of 38 items (15 pamphlets and 23 copies of a magazine) bound together in a sturdy modern brown cloth binding, with 'PAMPHLETS ON THE BLIND | FRENCH' and shelfmark in gilt on spine. The items are in good overall condition, on aged paper, with occasional slight chipping and wear to wraps. Label of the Board of Education Reference Library, London, and stamps and labels of its predecessor, the Science & Art Department Educational Library. 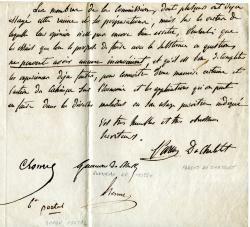 Autograph manuscript paper entitled 'Rapport au congrès Scientifique de Douai sur Les coutumes locales du Bailliage d'Amiens considerée comme documents historiques.' Autograph Letter Signed ('Bouthors') to Dinaux. Paper undated . 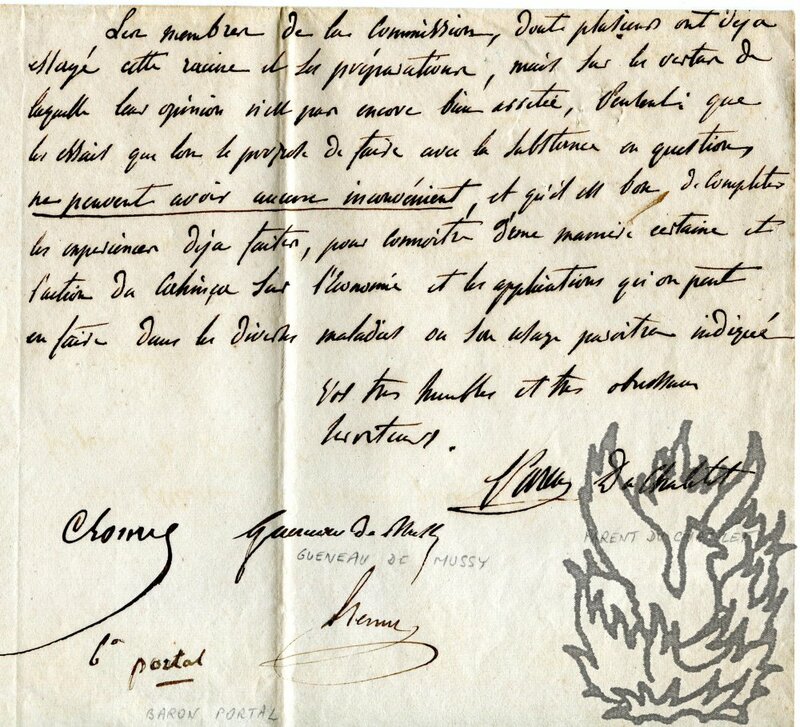 Letter dated 18 September 1835; Frévent. Paper: 4to, 6 pp. 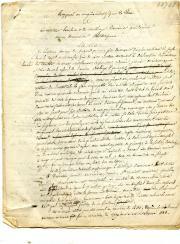 With addendum slip of a third of a page. Text clear and complete. On aged paper and lightly-creased paper. Closely written, with several deletions. This paper held some significance for Bouthors. The 'Bulletins de la Société des antiquaires de Picardie' (1864) quotes an address by him, in which he describes that society as 'la fille de l'association des Congrès scientifiques de France. Autograph Signature, in roman script ('A. N. Roussoff'). 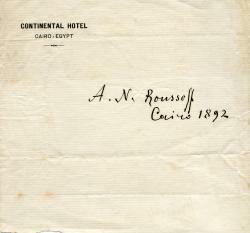 Dated 'Cairo 1892'. 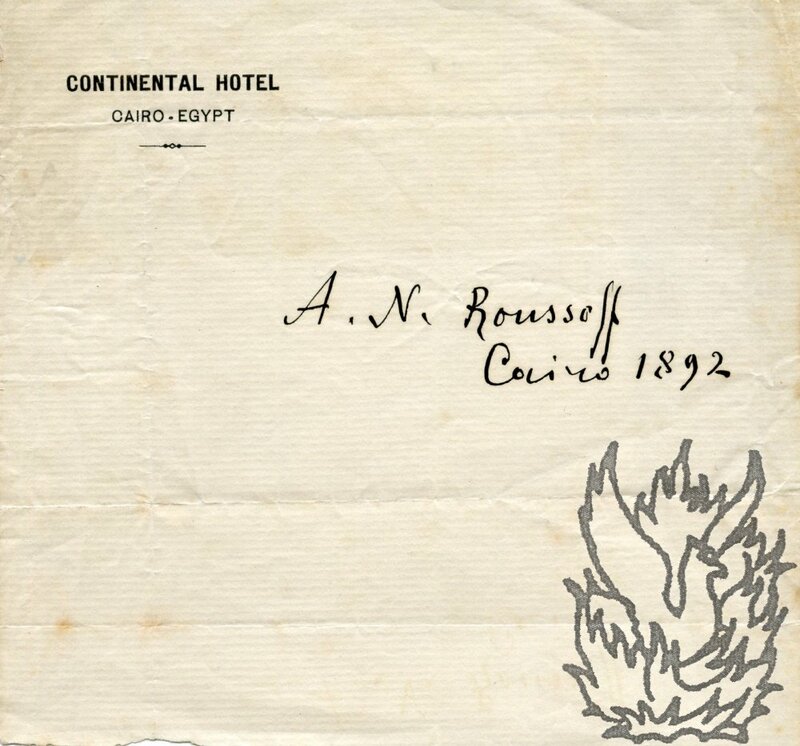 On letterhead of the Cairo Continental Hotel. On piece of watermarked laid paper 12.5 x 13.5 cm. In fair condition: lightly-aged and creased. Clearly in response to a request for an autograph. Firmly written, with the signature 5.5 cm long. Reads 'A. 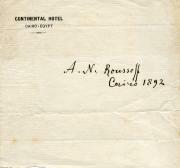 N. Roussoff | Cairo 1892'. Roussoff famously wagered that he could produce a dozen pastels indistinguishable from those of Whistler. He lost the bet, and was 'obliged to take a course of mud baths after his defeat'.